In recognition of the outstanding talent within ASPE, we annually honor two ASPE members with educator awards. The first award is the "Outstanding Educator of the Year” Award" and the second award is the “Emerging Leader of the Year" award. Nominations are sought each year a few months before our annual conference. We encourage both self-nominations and the nomination of worthy colleagues. The award is decided upon by a committee of former recipients who are selected by the president of ASPE. Past recipients of the Outstanding Educator Award have been involved in human simulation education for more than seven years, have made significant contributions to the community, and are recognized as leaders within their own institution, the community, and in national and international organizations. 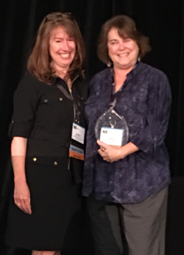 In 2013, a new award was developed in recognition of the Emerging Leader who has less than seven years in working with the human simulation methodology, has made significant contributions at the ASPE conference and ASPE committee(s), and is recognized as an up-and-coming leader in the profession. In recognition of the outstanding talent within ASPE, we annually honor two individual ASPE members through the ASPE Outstanding Educator Award and the ASPE Emerging Leader Award. The former recipients of these awards are listed below. It is now time to make nominations for the 2019 awards! We encourage both self-nominations and the nomination of worthy colleagues. Please send a brief letter of nomination for your candidate indicating why you feel s/he should receive the award. Include an updated resume or curriculum vitae. If you nominated an individual in the past, re-nomination is required for the person to be considered this year. The committee determining the award consists of several of the former award recipients. Nominations will be accepted until April 30, 2019 (11:59 pm ET). Please send your nominations electronically to Carrie Bohnert, [email protected]. The award will be presented at the 2019 ASPE Annual Conference in Orlando, Florida, USA.